And in those ancient times, the apostle Glenn scribed occasionally for MO, that is until Queen Ashley sent him to a later Yamaha event than this one, whereafter the feckless scribe filed his report with a competing kingdom for 31 pieces of silver. And he never worked in this town again. And yet, yea verily, it’s an ill wind that blows no man good, as the apostle JB was also at the later event where Glenn betrayed MO, and so JB and the Queen of MO became allies, combating evil everafter. 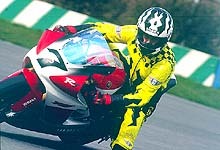 Before being cast out of the kingdom, the apostate Glenn did ride the amazing R7, and so it is ridden. could always sponsor a rider. Then at the end of the season you have an awesome track day tool to play with, if there is anything left of it after a hard year of racing at the Superbike level. First, the bike is fuel injected. The electronic twin-injector system meters fuel into the intakes which receive air from a massive 15-liter airbox, but without any ram-air ducting. All that air and unburned fuel is squeezed into the combustion chambers via 12 titanium inlet valves mounted in a CNC-machined cylinder head. This mixture is then squashed to 11.4 times atmospheric pressure by ultra-strong, ultra-light, short-skirt forged pistons with plated crowns. The pistons connect to the ion-nitrified crankshaft by “H” section titanium con-rods. Burned mixture is expelled past eight more titanium valves held in place by aluminum valve retainers. Plated cylinders and a one-piece crank are not unique technology but it’s better to have them than not. 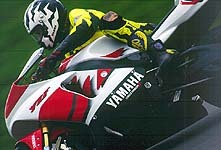 In order to ensure that the bike complies with a host of emission laws, Yamaha has shut down one of the two injectors per cylinder. This is how the bike is capped at 105 horsepower. Turn on the other injector, add a high-level, free-flowing exhaust system, make a minor modification to the ECU wiring, fit a high pressure fuel pump and the R7 will produce a claimed 135 horsepower. In full race trim expect this figure to rise to around 150 horsepower.Along with the other YZF-R series Yamahas, the R7 features compact and lightweight direct-ignition coils mounted in the spark-plug caps and is fed sparks from a compact, high-output AC generator via a DC-CDI arrangement. The multi-function ECU monitors crankshaft and camshaft speed, throttle position, temperature and pressure as well as controlling ignition timing and volume. The ECU also features a self-diagnostic system to help assist race mechanics. You may be surprised to learn that the YZF-R7 is not fitted with a dry clutch, although the wet multi-plate clutch does feature a back torque limiter to prevent lock up during aggressive down-shifts. The gearbox is a six-speed close-ratio racing set-up. 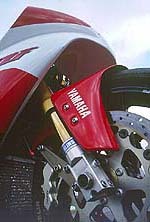 The gear shafts are mounted in the now familiar tri-axis arrangement and “stacked” vertically instead of horizontally to shorten the engine, allowing Yamaha to fit a longer GP style swingarm yet still keep its ultra-short 1,400 mm (55 inch) wheelbase. Take a look at Yamaha’s YZR GP race bike and notice how similar the YZF-R7’s black aluminum frame looks. 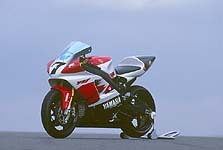 It should since Yamaha based the R7’s chassis as closely as possible to their two-stroke GP bike. Straight out of the crate the Yamaha YZF-R7 is perhaps the best handling bike available. Ashton commented that the steering was more nimble than even his 916 Corsa race bike — let alone an R1, which he described as “slow-steering” compared to the Corsa. Not only is the steering razor sharp, it also is extremely accurate — choose a line, any line, and the R7 tracks that line faithfully. We rode it in very high winds which, despite attempting to rip rider from machine, did little to faze the R7’s steering. Brake while in a turn and the bike behaves impeccably. Its mid-corner manners aren’t affected whether or not you use the brakes.The brakes are powerful, as you might expect since they are very similar to the R1’s set-up. What surprised me was their feel. They are very progressive, a nice touch because they are so powerful. The rear brake was also a gem. Too many motorcycles have rear brakes that are all or nothing. Not the R7, its rear brake is powerful and progressive. The bike is not designed for road use and is set-up rather stiffly. 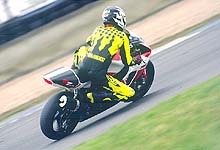 On the bumpier roads the rear shock transfers every jolt to the kidneys. The suspension is a lesson in control, despite the stiff set-up, and while on the bumpy Yorkshire roads the wheels stayed glued to the ground. 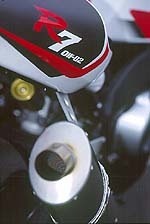 Only when gunning the R7 hard down a particularly bumpy straight was there even a hint of flap from the front-end. With the front wheel lightened from acceleration the bars would give a slight twitch in the riders hands, but it was far from the violent slapping the road might have induced on lesser bikes. And this was without a steering damper. The engine surprised us. Here we had a brand new bike, only two hours out of the crate and restricted to comply with the toughest regulations in Europe yet it was far from feeling tight, strangled or capped — the power delivery was sensational. Here is a 100 horsepower, 750cc inline four that thinks it’s an RC45. Apart from a little emission-controlled fluffiness below 3,000 rpm the power delivery was impeccable. Blip the throttle at tick over and the revs rise and fall at a moments notice, indicating the lightness of the crank and piston assembly. Get the R7 rolling and twist open the race action throttle a quarter turn — to full open — and the bike lunges forwards without hesitation. Between 4,000 and 6,000 rpm it pulls very respectably, comparable to my own Thunderace (Yamaha YZF-1000). Once the revs cross the 6,000 mark the bike pulls stronger than any “restricted” 750 has a right to. Despite being brand spanking new the bike was hungry for revs and the tach needle really moved by the time it swept past 10,000. Sympathy should have forced a gear change at this point, but the top-end rush was so addictive I couldn’t resist letting it run on to 12,000 rpm. For a bike with little more than a few miles in its bores it felt very free revving. I couldn’t wait to ride it in kitted form, and judging by the look on his face neither could Dean Ashton. The sound of the bike also surprised us. While a little noisy at tick-over, once underway the induction growl was reminiscent of an RC30 being caned across the Isle of Man TT circuit: A very deep, offbeat growl barked up from below the tank. Either standing at the side of the road for photographs or as I rode the bike I heard its growl, although you will also hear a more “normal” four-cylinder swish from the road-legal muffler. I found the sound addictive and only the threat of a beating from Ashton forced me to turn the bike around and return to base after an all-too-short ride.